York County Sheriff William King is interviewed by CBS 13 in this image. ALFRED, Maine — With all but one precinct reporting, York County Sheriff Bill King has secured a second term. King, a Democrat, led his Republican opponent Roger Hicks with 56.8 percent of the votes, compared to 43.2 percent, with 38 of 39 precincts reporting unofficial results by Thursday morning. 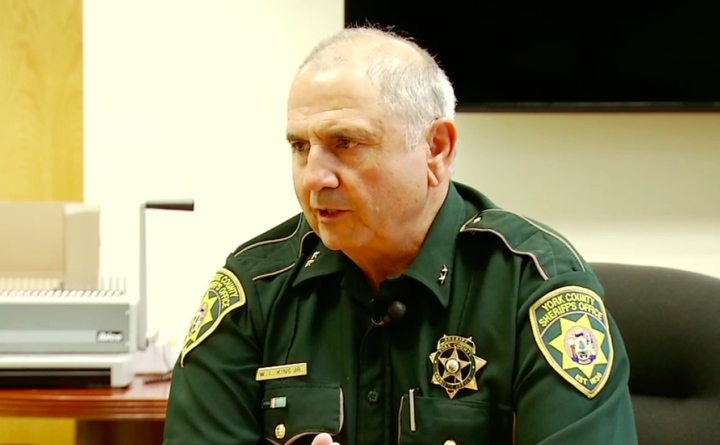 This year’s race for county sheriff drew statewide attention, as Hicks claimed the sheriff’s office was due for a change. The police services patrol division union endorsed Hicks, as well as the Sanford Regional Communications Association, made up of 911 dispatchers. But in the end it was King who prevailed, touting his federal experience and consideration for the taxpayers of York County. King, 65, from Saco, was born and raised in Portland, becoming a Portland police officer after graduating from the University of Southern Maine with a degree in criminal justice. He later went to work for the CIA, DEA, and helped start the predecessor agency to Maine’s bureau of drug enforcement. He retired after 25 years of federal experience. In 2010, he came to work for York County as a major and then chief deputy. He was elected sheriff in 2014. Previously, King said he was proud of many of the things he’d implemented during his time as sheriff, and hoped to continue those initiatives into a second term, such as employee recognition ceremonies, a team-based approach and increased community engagement. Stumping for King at the Kittery polls Tuesday, King’s personal friends Bob and Annette Beebe, of Portland, said King wants to keep repeat offenders out of jail and “break the cycle,” also to save taxpayers’ money. “He is just passionate about protecting the people and the taxpayers, getting them the biggest bang for their buck,” Bob Beebe said. King was not immediately reached for comment Wednesday. Two incumbent York County commissioners were defeated in their races Tuesday. In District 3, Democrat Allen Sicard of Saco beat Republican Cynthia Chadwick-Granger of Saco, and in District 1, Republican Robert Andrews of Acton beat Democrat Sallie Chandler of Lebanon.